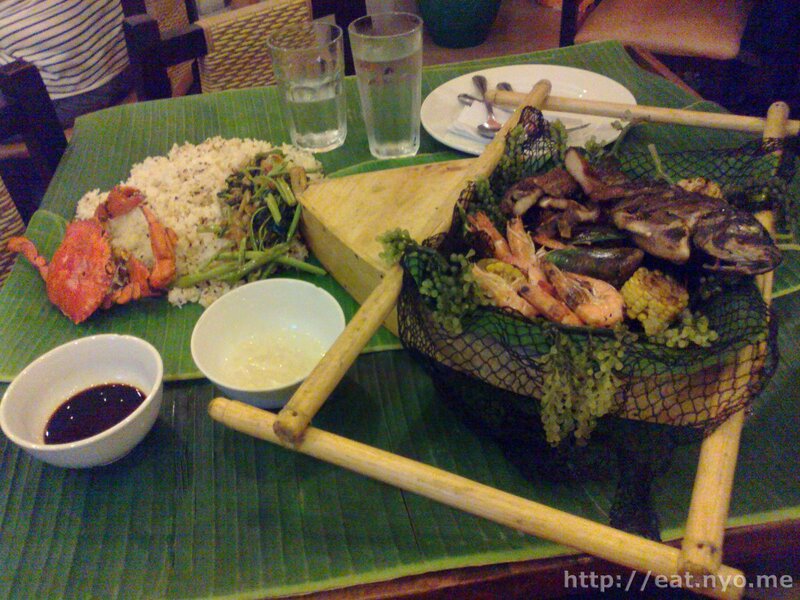 Beloved and I had dinner at Seafood Island, Cubao a couple of nights ago. We’ve been here before, but we didn’t get to try the reason you should go here the first time we went—the eat-like-a-pirate “boodles”. That was more than a couple of years ago, and we’ve been to its Trinoma branch a couple of times with friends to try out the boodle. I didn’t get to take pictures both times, since everyone dug in before I had the opportunity to. This time, since it was just me and Beloved, I can finally write a proper review. I’ve already said boodle twice, thrice if you count the one on the title. But what is a “boodle”? The best description I could give is a table full of food. These various platters, which is really an understatement to use as a term for this offering, have various stuff in it in addition to a mountain of rice good enough for four—and that’s the smaller boodle. They come in two sizes, good for three to four or five to six. Beloved wanted lato or sea grapes, and after finding a couple of these boodles out of a dozen or so that offer this, we chose their Palawan Shores (785 Php), good for 3-4. Our order literally came on a boat on a table covered with banana leaves. Like all the other boodles, it features a very generous amount of rice plus a variety of food, mostly seafood, good enough for at least three. Palawan Shores features clam meat fried rice, steamed crab, and kangkong with bagoong off the boat and shrimps, grilled corn, liempo (pork belly), tilapia, clams, and mussels, as well as Beloved’s sea grapes. This offering reminded me of our feast at The Seafood Club at Red Crab, with a lot more of everything, especially with the extremely generous amount of rice. Beloved prepared by grabbing her spoon and fork. I prepared by washing my hands, since I planned on using my fingers. Of course it wouldn’t matter if it didn’t taste good. But overall, I thought it was. Beloved enjoyed her sea grapes, despite lacking in strong flavor, had the enjoyable poppy texture as if popping plastic wrap in your mouth. She also consumed most of the clams and mussels happily. Most of the food was grilled, and I really enjoyed the liempo which seemed like it was marinated for quite a while. I also enjoyed the crab, despite being puny in size, had plenty of delicious crab fat in it. The shrimps could’ve used a bit more flavor, but the provided soy sauce and vinegar easily remedied that. I also enjoyed the kangkong, especially the parts covered in bagoong. The only thing I didn’t really enjoy was the rice, which had a slightly charred flavor I didn’t really like. When we were done, all that’s left were the inedible parts—shells from the crab, shellfish, and shrimps, fish bones, corn cobs, bamboo boat, and banana leaves—and about half of the rice. Yes, we finished everything but the rice, and, for me, that’s understandable. I also found this feast to be among the best value feasts we’ve had. Without service charge, we didn’t even reach 800 Php for all this. Of course, this was meant for three people at least, but for two people, this was still pretty good value. I’ll admit that it wasn’t as flavorful as other seafood feasts we’ve had, but it was more bountiful. 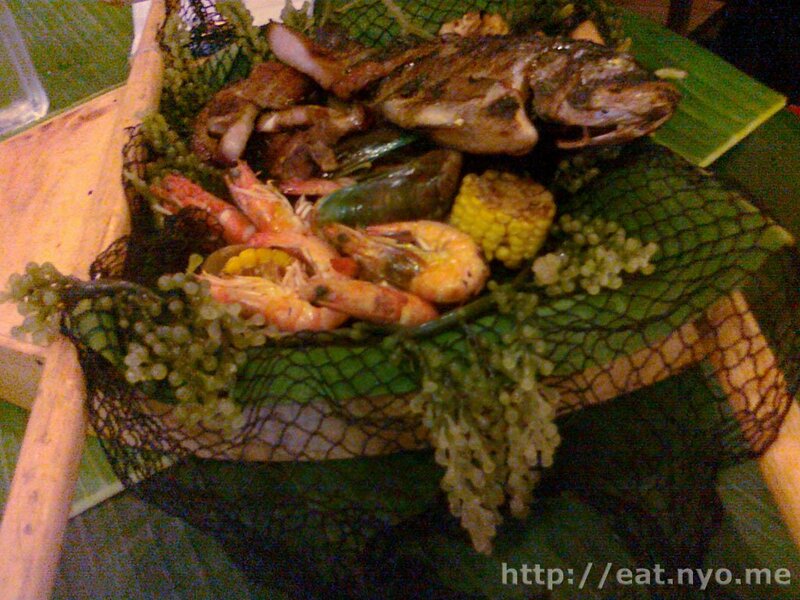 Basically, you should go to Seafood Island for the boodle. And if you’re doing their boodles, you should follow what I did and eat with your hands—it’s much more enjoyable that way. I shouldn’t really be reminding you, but make sure you wash up before you do. Not recommended for: Picky pirates. Smart nomnomnom tip: Order their boodles and use your hands.